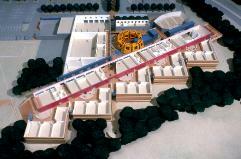 An illustration of the design process for The Rice School / La Escuela Rice, showing the progression from alternative site-planning and programming strategies, to the developed design. Taft Architects is a small firm undertaking a limited number of projects at any given time. This allows the partners, who work together equally on every project, to devote full and careful attention to the execution of each. The approach to each project is unbiased and responds to the particular aspects of program, desires and ideals of the client and user community, and the constraints and opportunities of the site context, resulting in unique solutions for each client. The process, which is both rational and pragmatic, requires significant client participation at every level. The exploration of alternative design strategies and other ideas forms the basis for evaluating conceptual directives. Three-dimensional architectural models, of incrementally greater scale and detail, to communicate and convey these options, concerns, responses and ultimate decisions, are an integral part of this approach. All aspects of the design imperatives, including function and architectural character, are considered simultaneously at the outset of a project, not later applied. With this philosophy, the office has accomplished buildings of various sizes and types, within schedule, at or below budget, and at the same time achieving a high degree of environmental fit.